's three microphones and powerful, digitally tuned speaker provide full 360-degree coverage, whether you use the system in a conference room or your office. The built-in keypad looks and works like a touch-tone telephone, offering such handy features as a mute button and flash key. There's even a jack to plug in a tape recorder. SoundStation is as easy to install as it is to use. The compact console unit is connected by a single cord to a wall module or universal module containing both power and telephone interfaces. SoundStation can be configured at the factory to meet the specifications of virtually every country's telephone network. Best of all, SoundStation's superior sound quality outperforms all other full-duplex conference phones. No wonder it's the best-selling conference phone in the world today. Make a sound investment in better business communications. In today’s Internet driven world, the ability to conduct real time communication and collaboration has become critical to an organization’s survival. As the market leader in voice, video and content collaboration and communications, our award-winning conference technology makes it easy for people to interact and maximize productivity – over any network, in just about any environment, anywhere around the globe. That’s why more organizations worldwide use and prefer Polycom conferencing solutions. Because when people work together, great things happen. 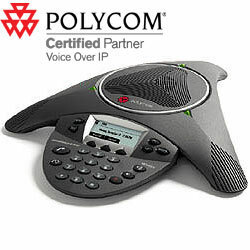 See how you too, can achieve great things with the Polycom SoundStation IP conference phones. For all conference calls, the SoundStation IP 6000 delivers advanced audio performance that far exceeds previous generations of conference phones. From full-duplex technology that eliminates distracting drop-outs to the latest echo cancellation advancements, only Polycom can deliver a conference phone experience with no compromises. Plus, Automatic Gain Control intelligently adjusts the microphone sensitivity based on where participants are seated in the conference room, making the conversations clearer for all participants. It also features technology that resists interference from mobile phones and other wireless devices, delivering clear communications without distractions. The SoundStation IP 6000 leverages Polycom’s strong history in both conference phone and VoIP technology to deliver the most robust standards-based SIP interoperability in the industry. It shares the same SIP phone software base with Polycom’s award-winning SoundPoint IP products – the most comprehensive, reliable and feature-rich SIP products in the industry, with proven interoperability with a broad array of IP PBX and hosted platforms. Robust provisioning, management and security features make Polycom’s family of IP conference phones the only choice for meeting rooms in SIP-based environments. Integrated Power over Ethernet (PoE) simplifies setup, with an AC power kit available for non-PoE environments. Plus, the SoundStation IP 6000 includes a high-resolution backlit display for vital call information and multi-language support. The SoundStation IP 7000 is a breakthrough conference phone that delivers outstanding performance and a robust feature set for SIP-based VoIP platforms. It is the most advanced conference phone ever developed, and is ideal for executive offices, conference rooms, and board rooms. The SoundStation IP 7000 features Polycom HD Voice technology, boosting productivity and reducing listener fatigue by turning ordinary conference calls into crystal-clear interactive conversations. It delivers high-fidelity audio from 160 Hz to 22 kHz, capturing both the deeper lows and higher frequencies of the human voice for conference calls that sound as natural as being there. The SoundStation IP 7000 is the most flexible and expandable conference phone ever developed. Connect two units together for increased loudness and microphone pickup, as well as multiple call control interfaces in the conference room. Connect up to two optional expansion microphones to a single phone to ensure close proximity for everyone in the room. In the future, you will be able to connect the SoundStation IP 7000 to the Polycom HDX high-definition video conferencing system for a complete, integrated voice and video conferencing solution. In the SoundStation IP 7000, Polycom has combined its rich history in voice conferencing and VoIP technology to develop a groundbreaking new conference phone that is the clear choice for SIP-enabled environments. It shares the same SIP phone software with Polycom’s award-winning SoundPoint IP products – the most comprehensive, reliable and feature-rich SIP products in the industry, with proven interoperability with a broad array of IP PBX and hosted platforms. Plus, the SoundStation IP 7000 features a large multi-line high-resolution LCD display with a full XHTML microbrowser, turning your conference phone into a robust applications platform for your conference room. Bundled applications include advanced three-party conference features and LDAP corporate directory integration.